Sent to do an ultrasound to check fluid and baby's growth. Baby was healthy and looked great but measuring 35weeks, fluids were 8.9 - they want 12-9 for fluid levels. Our doctor was worried if we waited the baby could go into distress and fluids could drop more. So we were Admitted for induction at 12, started cytotec at 1:40 took every 4 hours to thin the cervix. At 5am on March 25 pitocin was started, my water was broke at 12 noon and I was dilated to a 3. Labor continued on and got very intense- very little progression was made between 12 and 4 pm (only dilated to a tight 4 :/, however effaced to 90% in that time. Contractions were close and strong but not strong enough to cause cervical change. Due to pit and monitoring I was unable to move around a lot, which made contractions very hard to manage, but I just took them one at a time breathing through them. Pit was yo-yoed back and forth from 6-8-10-12, Took 2 does of of iv pain meds around 3 and 6. At 8 pm after 8 hours of hard labor in one position and very little cervical change we decided to get an epidural. I was running on 10 hours of sleep between the past 3 days and from laryngitis that had last over two weeks and was extremely exhausted. Since they had to start my body from scratch the progress was very very slow, Bc Emmie just wasn't quit ready! ( she was a trooper though! Her heart rate never faltered or went into distress!) we decided at 9pm that if we wanted to progress the pit would have to be increased I just couldn't handle hours more of labor on pitocin. So we decided to get the epidural. It was the right decision for us and I don't regret it at all. It allowed me to progress from a 4 to a six in 3 hours and rest which physically and mentally I desperately needed from the anxiety of being medically induced without warning at our 38 week apt to being checked with intense contraction and no change myVBody was worn out. We got the epidural at 9pm and progressed to a 6 by 12 midnight on the March 26th. By 2 I was dilated to a 7! Yey! However when 4:30 rolled around Emmie started to show signs of distress from the 24hours plus of labor and he head was starting to swell. The doctor felt it had been too long and it was time to do a c-section. So we agreed, we just wanted to hold out baby - so at 6:10 baby Emmie entered the world with the sweetest cry I have ever heard! We we. Able to have immediate skin to skin and she came to recovery with me. We wanted a natural child birth and had prepared for one, however, our ultimate goal was to have Emmie Mae here happy and healthy and for me to be healthy. We succeeded in these to tasks. 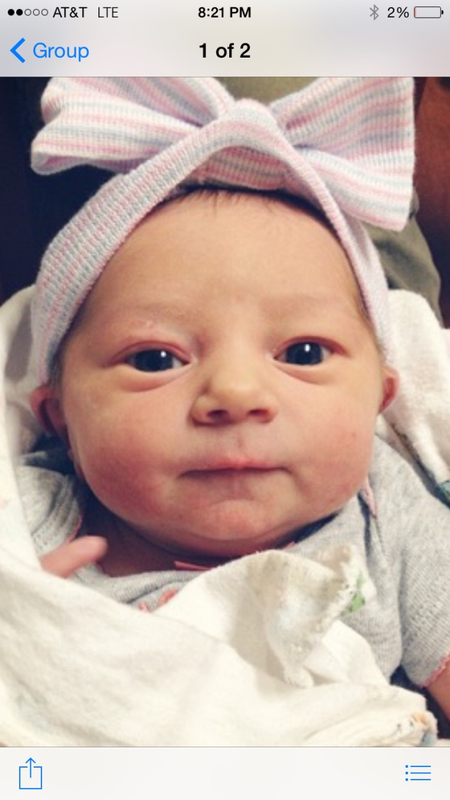 We couldn't be more thrilled to have or sweet baby girl here! It was an amazing journey and we are so ready to start this next chapter.